This photo is what happens when we remember to bring a real camera but don't check the batteries first. 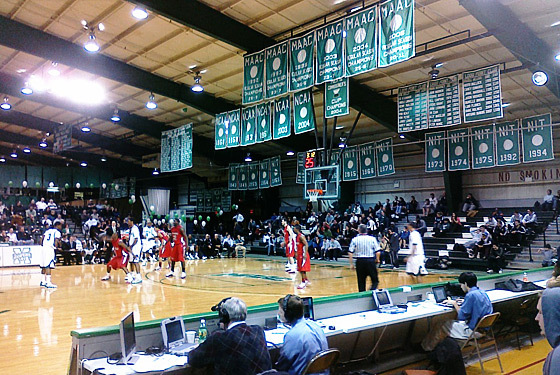 On Monday night, our tour of D-1 basketball venues within city limits took us to Manhattan College's Draddy Gymnasium. The Jaspers find themselves near the bottom of the MAAC standings this year, while their opponent, the Fairfield Stags, find themselves near the top. (They're currently battling for position with Iona to determine the second seed in the conference tournament behind Siena.) So it's not surprising that Fairfield controlled the game throughout, exposing Manhattan's lack of size and inferior shooters — an unfortunate combination — in a 74–56 win. We're getting down to crunch time on our tour: After this one, we've got just three schools remaining, culminating with Columbia next Saturday night. (Once again, the winner receives a print-out of the blog post and two sticks of butter.) So without any further ado, on to the scoring. Facilities. You know how, at your high school, the football field was surrounded by the quarter-mile oval track, and how the whole complex was, by nature, "multipurpose?" Well, Draddy Gymnasium is multipurpose to the extreme, to the point that the basketball court almost seems an afterthought. The whole building seems an ode to the track team, a high-school complex with no football field in the middle. (For all the track love, it still struck us as odd that the track itself appears to be made of concrete.) The game itself is just one ring of the circus, with people milling about and working out and socializing and doing whatever throughout the massive hall. After an hour of discussion, we finally figured out what seeing a game at Draddy is like: watching one of those Final Four games they play in massive arenas from the upper deck, a tiny court lost in all the madness. Which would be fine if we weren't sitting courtside. Score: 4/10. Quality of Play. Manhattan isn't a terrible team this year, but they're clearly not at the level of some of the Bobby Gonzalez–led teams of the mid-aughts. We will tread carefully here, but as much as a human-interest story as one-handed center Kevin Laue is, and as excited as we were to see him take the floor, if your backup center has one arm, your team has some holes to fill. (Laue is fine on defense, but it'd be fair to refer to his offensive game as "limited.") Meanwhile, Fairfield looked to us like a tournament team. Siena, watch your back. Score: 4/10. School Spirit. Give the Manhattan crowd credit: They remained lively well into the second half even though their team was getting manhandled. (The sizable contingent of Stags fans, by the way, matched their enthusiasm and then some.) Manhattan doesn't have a mascot — though we see no reason there shouldn't be a giant foam representation of Brother Jasper of Mary, the university's onetime baseball coach, prefect of discipline, and possible inventor of the seventh-inning stretch, for whom the teams are named — but they do have cheerleaders, a dance squad, and a band. In general, we were kind of astounded by how much of the goings on resembled a high-school game, and not just because of the layout of the venue: The softball team sold 50/50 raffle tickets to raise money, the dance team sold team calendars to raise money (they presumably got this idea from Zach Morris), and bunches of green and white balloons provided some low-budget décor. Score: 6/10. Coziness. For a place that seems to treat basketball as something other than the center of attention, Draddy is a comfortable, welcoming place. You can grab a hot dog and diet beverage for four bucks, and bathrooms are easily accessible and never particularly crowded. Careful, though: It's not exactly the easiest place to find. Located at the top of a hill on Manhattan's Riverdale campus, you'll stumble around the "quad" for half an hour before you finally give up and ask a student to point you in the right direction. It is a lovely campus, though, and the subway's just across Broadway. Even on a holiday Monday, we didn't have to wait for the 1 train to leave from 242nd Street more than 15, 20 minutes. It's quicker than getting to Citi Field, we'll say that. Score: 7/10. Miscellaneous. The Manhattan athletic department is single-handedly keeping the Riverdale banner industry afloat. Draddy has a banner for everything. There are the usual celebrations of NCAA appearances and MAAC regular-season titles, but also banners naming the college's Olympians and 1,000-point scorers in basketball, and ones with snappy titles like "Men's Basketball Most Outstanding Players: First 100 Seasons" and "Manhattan College Alumni Hall of Fame Outstanding Team Awards." But just as we awarded points to Fordham for sparing us from hearing "Empire State of Mind" for the umpteenth time on this tour, Manhattan loses a point for playing it twice: We heard it once through the walls while we were waiting to enter the gym, and again when the teams took the court prior to tip-off. We're also adding a point because Joe, who went to Fordham and is writing this part, is sure he's subconsciously biased against his alma mater's cross-Bronx rival. Score: 5/10. FINAL SCORE: 26. Manhattan finishes in a tie with the Garden, ahead of St. Francis and LIU, but behind Fordham — which is a shame, because if they won, we're pretty sure they'd raise a banner to celebrate. Next up: Tomorrow night, Bryant at Wagner, 7 p.m. at the Spiro Sports Center in Staten Island. It's "Rock Nite," whatever that means. Be there.